Kent Peterson has lead Fluid Imaging Technologies since joining the founder Chris Sieracki in 2002. The Company has sold over 750 FlowCams in over 50 countries. Ship-based FlowCam systems have also been at work sampling from every ocean in the world. Mr. Peterson has served on a number of boards and is active in community affairs. He has also been named Mainebiz Business Leader of the Year. Fluid Imaging Technologies’ awards and recognitions include, the Governor’s Award for Business Excellence, the S.B.A. New England Exporter of the Year award, the Portland Regional Chamber’s Robert R. Masterton Award and Best Places to Work in Maine. Mr. Peterson is an honors graduate from Boston University’s Graduate School of Management, and a member of the American Mensa Society. 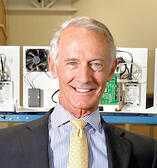 Read the MaineBiz interview with Mr. Peterson- A tireless advocate for Maine.